IBM Lotus Domino 8.5.2 comes with a new feature called XPages extensibility. See here for the XPages Extensibility API Documentation and here for a podcast (podcast) about it. Get the sample code from here. A new project has been created which contains a simple sample for how to to develop a 'native' XPages control via the Java extensibility API. This control can be deployed globally as an OSGi bundle/plugin to Lotus Domino and Lotus Notes/Domino Designer and then used in all NSFs without having to put the code in multiple NSFs redundantely. This mechanism allows for example ISVs to build and package their controls as libraries that show up in Designer as other out of the box controls. 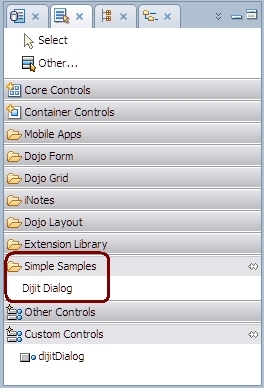 The control encapsulates the Dojo control dijit.dialog – see here.